Today, just after 9:00 a.m., Costa Mesa police officers responded to a reported traffic accident at 17th Street and Monrovia Avenue. 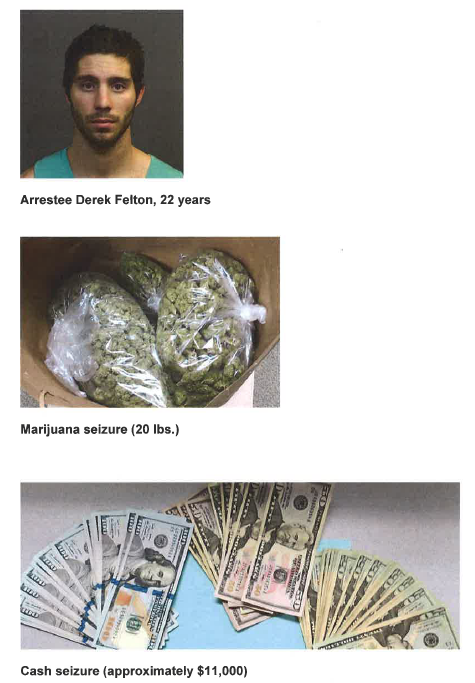 Due to some alert police work they arrested a 22 year-old man, Derek Felton, with 20 pounds of marijuana, nearly $11,000 in cash, nearly an ounce of cocaine and prescription drugs. 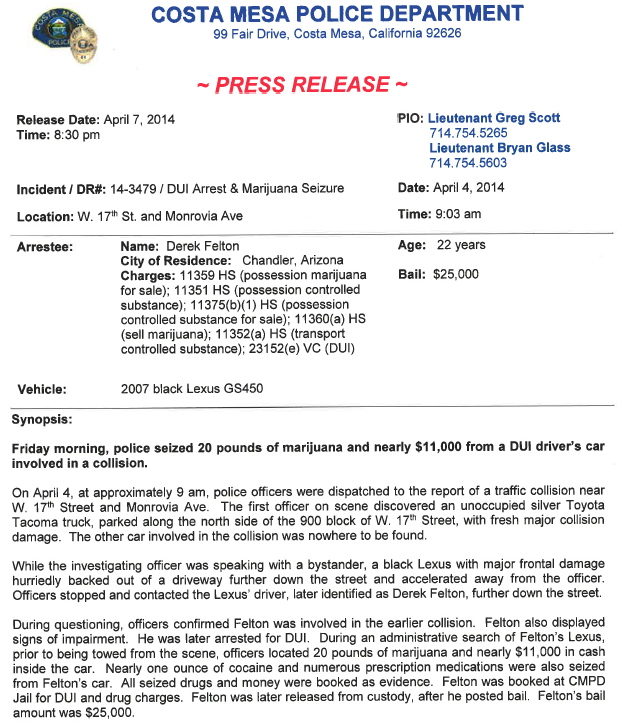 You can read the police Press Release below. The person arrested turns out to be a former Arizona State University student from Chandler, Arizona, with a goal of becoming a firefighter. Methinks those aspirations are now dead in the water. He was released on $25,000 bail. Imagine if Mensy hired a PI to help augment CMPD's work instead of guarding $5 signs..
Is this the part where Mayor Pinocchio claims credit for the bust? So lets see, over the weekend two people get stabbed, two others get violently assaulted and now this drug hauling scumbag decides to play crash em' up on the busy City streets, but wait for it, somehow the Mayor and Junior Mayor will still cry that there is NO crime problem in the City. I wonder if this, apparent, criminal was the one the supplied the young kid I ran off my property for hiding his stash of cannabis on the property. He was mightily displeased when he found that I had mixed it with some soiled cat litter and dumped the lot in our dumpster. I don't suppose it smoked clean after that. If the individual arrested is convicted I hope he learns something and straightens out. As more and more peer-reviewed research shows, pot makes you dumb. Let's not forget all the sober living drop outs that come here from out of town. When they get kicked out where do you think they go. That's right - they are now Costa Mesa's problem. Looks like we may need to change our city slogan to hub of the homeless.